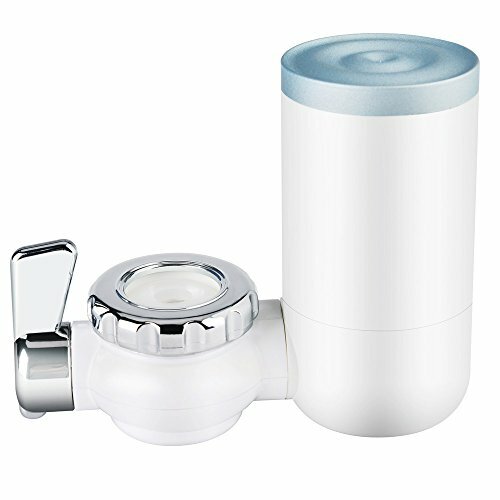 If your family uses a lot of filter water per day, then our Faucet Mounted Water Filter system is your solution. ; It uses a multi-stage filtration method. ; It is a step-up from the water filter pitcher in terms of the number of contaminants it can reduce. ❗❗❗The filter element must be cleaned or replaced in time. Because the excessive dirt will cause the tiny pores of the ceramic filter to become clogged. This will cause the pressure in the filter chamber to exceed the rated pressure and squeeze the filter chamber cover to burst. Applicable Water Source and Applicable Minimum Dynamic Water pressure: Municipal Tap Water and 70kpa. 1. Do not let the warm water over the temperature 35°C pass through the purified water side. 2. Do not let the hot water over the temperature 50°C pass through the raw water side. 3. If the purifier water n to be stored, please store it in the refrigerator. Use it ASAP. 4. Do not raise fish in purifier water. 5. When the filter water is smaller, the filter element needs to be cleaned, use sandpaper or dishcloth to clean the filter element, please gently wipe. 6. Replace the filter regularly, filter replacement cycle is recommended for 3-6 months, according to different water quality. Getting our Faucet Water Filter is a no brainer! ECONOMICAL & ENVIRONMENTAL - Keep your tab water clean, fresh and safe for your family by using the faucet mounted water system, save on the bottled water or water filter pitcher for more economical and environmental option. Satisfaction Guaranteed, 30days exchange or refund, and 1-year product warrantee.